The cardiology team at St. Mary Medical Center in Langhorne recently became one of the first health systems in the region to offer MitraClip therapy—a minimally invasive treatment option for people with a severe leak in the mitral valve who are considered too high-risk for traditional open-heart surgery. “The cardiology team at St. Mary Medical Center is proud to offer innovative therapies that expand our patients’ access to care and can give them a chance at a better outcome,” says interventional cardiologist Ronald H. Fields, M.D., Medical Director, the Heart and Vascular Lab at St. Mary. The most common heart valve disease, mitral regurgitation, is usually treated with open-heart valve replacement surgery. However, some patients are not healthy enough to tolerate surgery. The mitral valve on the left side of the heart has two flaps that open and close to allow blood to flow. Leaks occur when these flaps do not close completely, so the heart has to work harder to keep blood flowing, which raises the risk for life-threatening stroke and heart failure. Severe mitral valve regurgitation can profoundly affect a person’s quality of life by causing shortness of breath, extreme fatigue, and other debilitating symptoms. The small MitraClip device is guided into place with a catheter and then attached to the flaps of the mitral valve to help it close more completely, restoring normal blood flow. Patients tend to have a short hospital stay and experience improved heart function and symptoms almost immediately. In addition, St. Mary Medical Center is the first in Bucks County and among the first in the region to offer peripheral intravascular lithotripsy to treat and open arteries in the legs that are blocked by severe calcium deposits. The new Shockwave IVL (intravascular lithotripsy) system is based on the lithotripsy technology that has been used in urology for more than 30 years as a safe and effective procedure to break up calcified kidney stones. A miniaturized lithotripsy device is delivered via balloon catheter and uses high-speed sonic pressure waves that pass through soft tissue to selectively break up hardened calcified plaque inside the vessel. The goal: to improve outcomes for patients with peripheral artery disease (PAD) who have severely calcified vessels. David Drucker, M.D., an interventional cardiologist at St. Mary who specializes in peripheral vascular procedures, successfully performed the first intravascular lithotripsy procedure in June on a patient with a history of symptomatic PAD. Specialized cutting, rotational, and high-pressure catheters traditionally used in balloon angioplasty are not always effective in treating and breaking up complex calcified lesions in the arterial wall. This new technology tackles the most challenging calcifications, while potentially reducing the risk of serious complications. St. Mary Medical Center is ranked the 19th best hospital in Pennsylvania and “high performing” in four different adult procedures and conditions, including heart failure, chronic obstructive pulmonary disease (COPD), hip replacement, and knee replacement, according to the most recent U.S. News & World Report ranking. Hospital rankings are based on survival and readmission rates, volume, patient safety, patient experience, and quality of care. High-performing designations are based on quality indicators such as volume, nurse staffing, specially trained physicians, and patient satisfaction scores. Visit StMaryHealthCare.org to learn more. 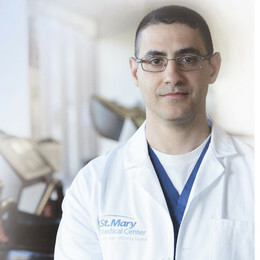 To learn more about advanced cardiovascular care at St. Mary, call (215) 710-6026 or visit www.StMaryHealthCare.org.